In an earlier post, we covered numerous details and history regarding America's fledgling highway system. Back in "the day", roads were not called Interstates or Routes, just "Trails". That was because most were unmapped and unpaved "cow paths" best suited for hoof and sometimes buggy's or wagons. We also did another on some "pioneers of driving, such as NJ's Alice Huyler Ramsey - The Amelia Erhart of Cars. (Part One and Part Two) Good reads, you should check them out. 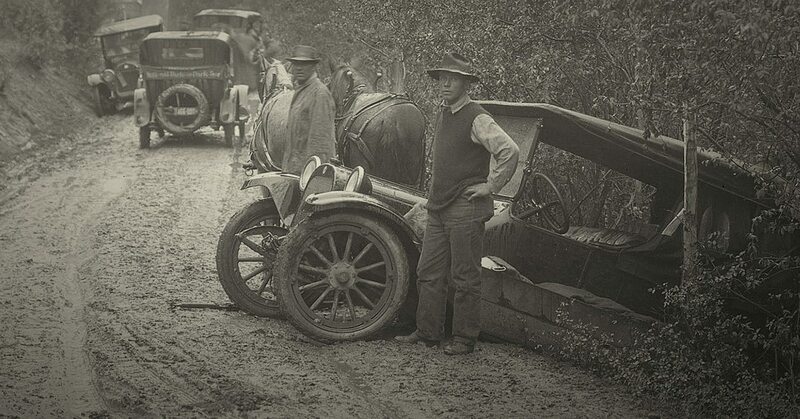 Before the 1900s, any long distance travel across the United States was accomplished in one of three ways. First, there was travel by boat, which depended entirely on river routes and coastlines. Then there was travel by horse or wagon, which was slow and hindered when it came to impassable mountains and rivers too deep to ford. Lastly, there were trains, much faster than horses and able to handle rough terrain once engineers and workmen laid the tracks. But the problem with trains was their expense and restriction to timetables. The turn of the century brought a new invention into the hands of Americans. At first considered an amusing toy with only about 8,000 of them in the US, the automobile would develop into the dominant form of American transportation. When Horatio Nelson Jackson, after countless breakdowns, succeeded as the first person to cross the North American continent in 1903 with an automobile, it did more than signal the rise of the “horseless carriage.” The event indicated a growing need for automobiles that were durable enough to survive long distance travel. 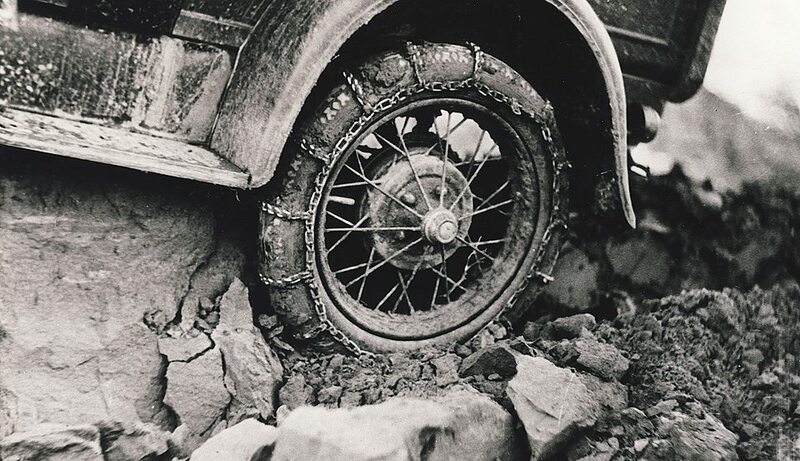 Larger gas tanks, cargo space, and more durable tires and other car parts were all useful adaptations, but adapting the automobile was only half the battle. First, the automobile had to be affordable. Cars were a rich man’s novelty until Henry Ford’s assembly line cut production costs and released the 1908 Model T onto the market. Automobile ownership skyrocketed, but then there was the problem of road conditions. Before 1920, most roads were dirt, hard-packed and rutted. Cars got stuck in the mud so often that local farmers could make a significant amount of money using their horses to haul them out. Dust was also a constant problem, so much so that drivers wore dusters and goggles. Gravel and macadam (oil and crushed rock) roads were improvements, but governments willing to spend the money could produce concrete and asphalt roads. Aside from the roads themselves, many other aspects of travel were only just being developed by the time the 1920 National Park-to-Park Highway automobile tour occurred. There were few, if any gas stations, convenience stores, and mechanics. Long-distance highways needed to be planned, signposted, and mapped. Good roads movements and automobile clubs including Automobile Club of Southern California and AAA worked to improve travel for motorists. 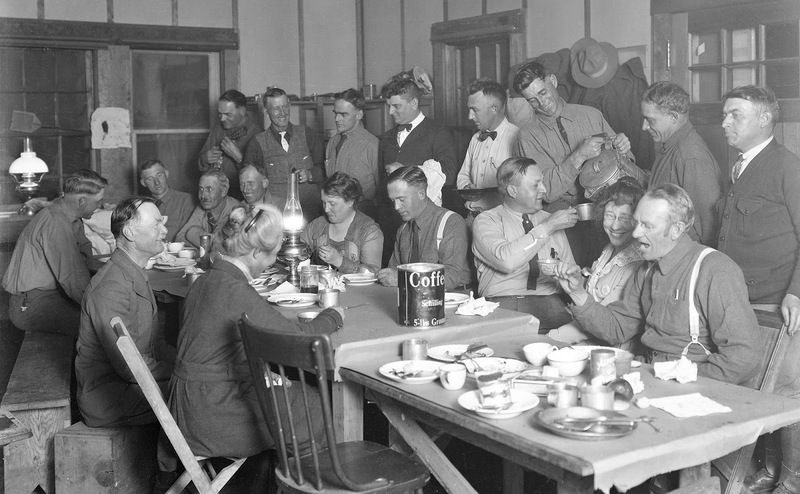 Their work included building the Lincoln Highway, the Yellowstone Highway, and the National Old Trails Road. The federal government also had a hand in funding roads, and their efforts culminated in the Federal-Aid Highway Act of 1956, which established the Interstate Highway System. 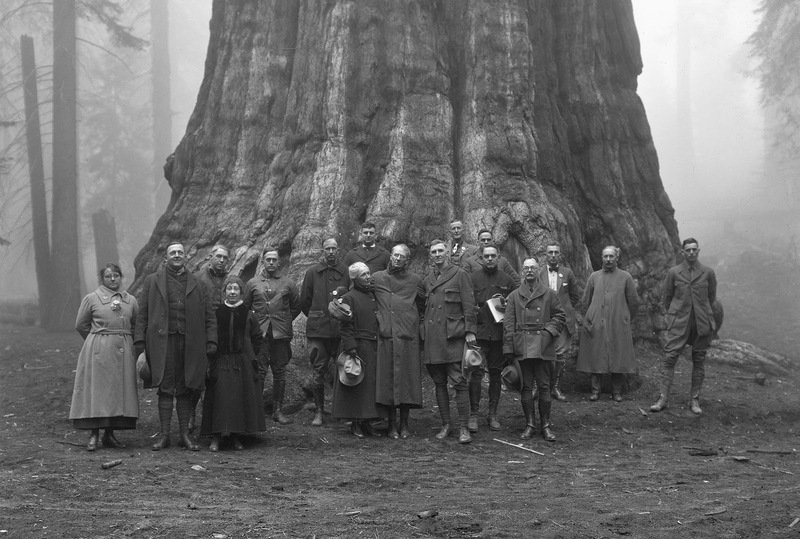 In 1914, Secretary of the Interior Lane entered into an agreement with the Office of Public Roads to develop road access to Glacier, Sequoia and Yosemite National Parks. When Stephen T. Mather became involved with the National Parks, he invited the Office of Public Roads Engineer T. Warren Allen to speak at the 1915 Berkeley National Parks Conference. Mather had concerns over letting the Office of Public Roads develop highway systems within the National Parks. While Allen's approach to public roads saw no difference between National Forests and National Parks, his involvement was an early indication of the public interest in driving. It was the following year that Mather joined the campaign for the Park to Park Highway. 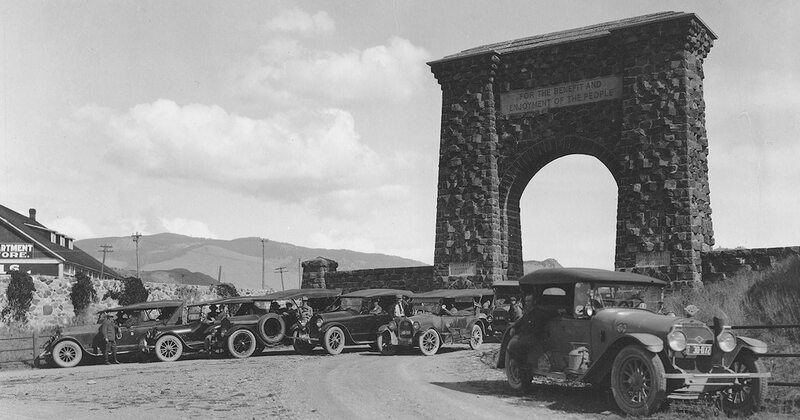 The National Park-to-Park Highway Association was formed in 1916 and began promoting roads and roadway improvements in the Northwest and Rocky Mountain states. Other Highway Associations had been supporting a variety of routes linking the scenic wonders of the western National Parks. In 1917, the Parks Highway Association began marking the route from Glacier to Mount Rainier and added a southern segment to Crater Lake. 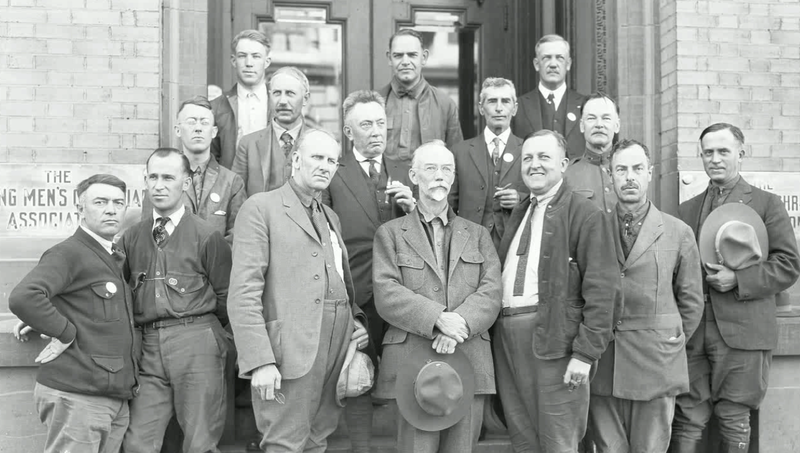 By 1919, there were annual meetings of the National Park to Park supporters. That same year, Charles Goodwin was assigned as Superintendent at Glacier. Here, he began to work on developing potential routes through the park. When Mather's preference for an east-west link across the park was made known, he began looking for a route to link the two sides that would complement the Park-to-Park Highway. This route would become the Going-to-the-Sun Road. 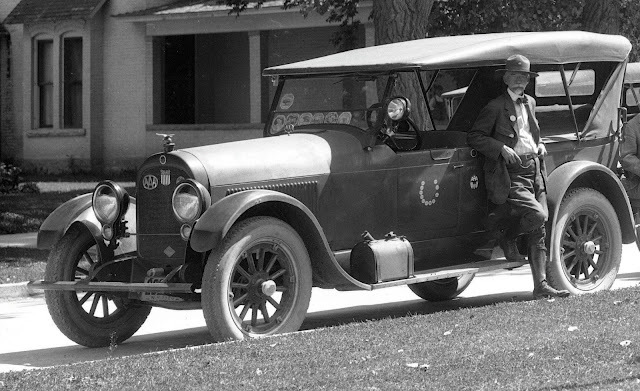 By 1920, eleven states were involved in the Park-to-Park Highway program. The proposed route would cover 6,000 miles (9,700 km) of roads and numerous feeders to and from the various National Parks. The tour followed a set schedule, averaging a distance of sixty-five miles in a day. Each town they visited provided a chance for the leading tour members to give speeches on the importance of supporting roads to the National Parks. Municipal promotion and maintenance of roads would mean tourism traffic with new money and settlers for the towns near major highways. After journeying north and west through Rocky Mountain, Yellowstone, and Glacier National Parks, Westgard fell ill and left the touring party in Spokane. 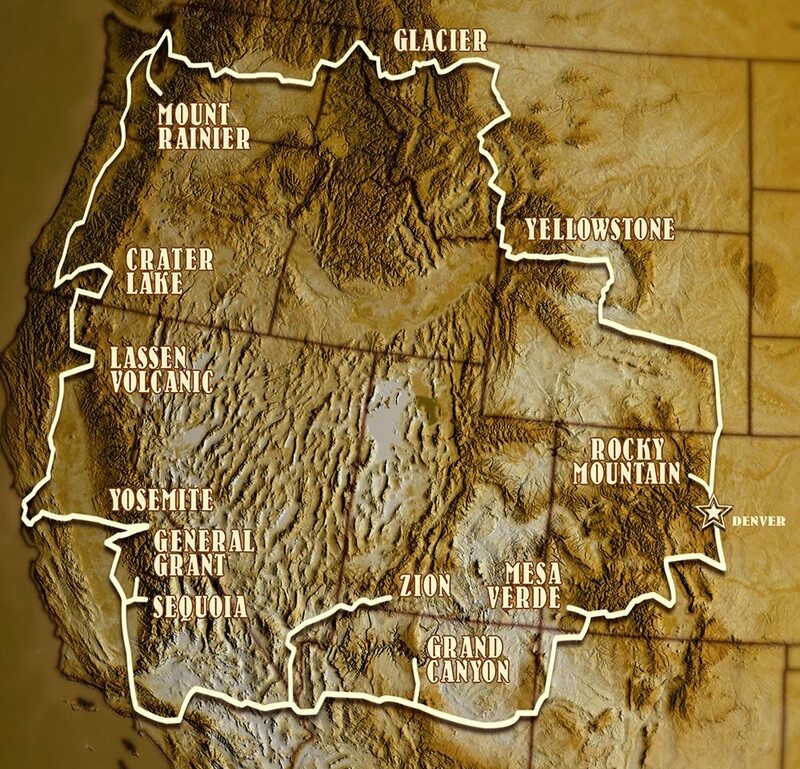 Holm’s took over Westgard’s duties and continued to lead the caravan south through Mount Rainier, Crater Lake, Yosemite, General Grant (now King’s Canyon), and Sequoia. 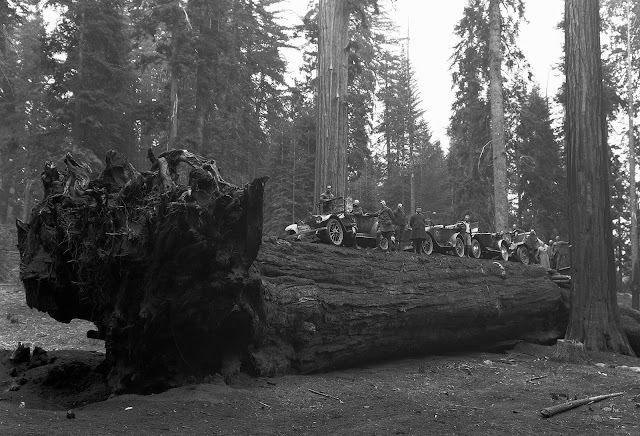 Lassen Volcanic Park had no roads in 1920, so the tour had to bypass it. In Sequoia National Park, the tour began to face winter weather. They had no trouble with this further south, past Zion and the Grand Canyon, but once they headed north to Colorado, snow became a problem. Many tour members continued to Denver by train, but the remaining seven members stuck it out to see Mesa Verde and enter Denver in their travel-seasoned automobiles. The tour officially ended with the first National Park-to-Park Highway Convention in Denver. 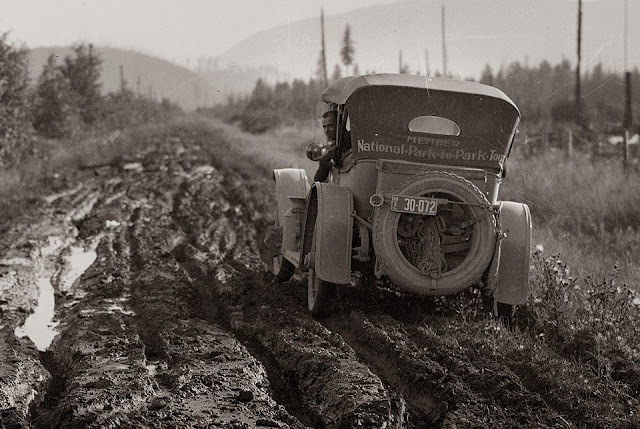 The National Park-to-Park Highway Association authored maps, pamphlets, and provided roadside assistance for motorists for the next six years. 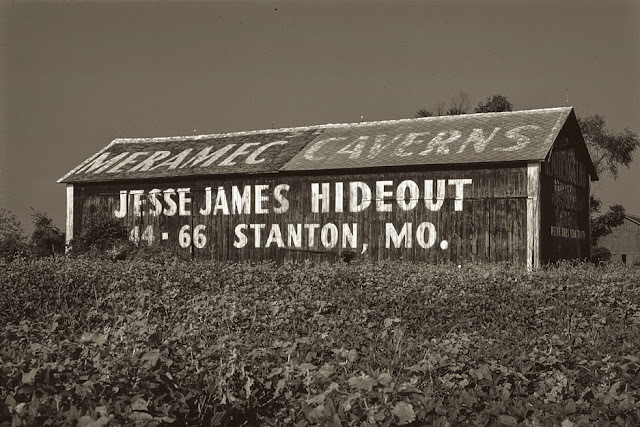 In 1926, the Association disbanded as federal- and state-funded road-building took over. If you've enjoyed this story so far, you might want to treat yourself to watching the documentary. Here's a sneak peek and link to rent for streaming.